Roots and Fruits, Imaginor’s cornerstone publication, will provide you with resources to fully support Christian worship and spiritual and moral development in your school. Shahne Vickery has been joined by international storyteller Bob Hartman as well as poets, artists, photographers and a team of educational professionals to produce this inspirational new collective worship resource. 12 Christian values are explored in a 2 year programme of fully worked, creative material. 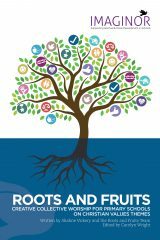 Clearly rooting all learning in the Bible and the Church year, Roots and Fruits is designed to support SIAMS requirements and meets the criteria set out in the Evaluation Schedule. – develop the Christian vision, values and ethos of the school and contribute to spiritual, moral, social and cultural development of participants. Each assembly follows the pattern established in earlier publications and includes 4 elements – Welcome, Learning, Reflecting and Responding – which match to the Window, Mirror, Door strategy that has proved so popular with teachers. All key material – pictures/photographs, instrumental music and songs (including songs from ISingPop written to support and reinforce the values), and prayers – for display on screen etc are available to download by following the AVAILABLE DOWNLOADS link.